This past weekend SportTracks enabled support for automatic sync with Garmin Connect. 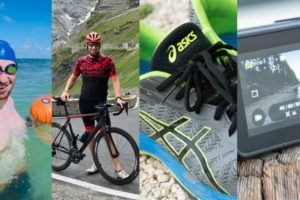 This rounds out the ‘big three’ when it comes to endurance athlete sites and Garmin Connect Auto Sync (including Training Peaks and Strava). There are of course other more fitness-focused sites out there that are equal or larger in size, but none of them focus on the endurance athlete as much as the three noted. This automatic sync means that as soon as your Garmin device workout syncs to Garmin Connect, it’ll show up a few seconds later on SportTracks. This uses the same backend functionality that was introduced this past summer for the other sites. 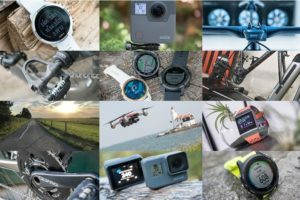 Note that while this is Garmin device focused, SportTracks told me they’re eager to get such setups in place with Polar and Suunto once those companies are ready to do so. Finally, note that there are some differences here from other sites that have enabled sync. Specifically that SportTracks can sync your entire history (not just 30 days), as well as showing advanced Garmin-specific metrics like Running Dynamics – which are found on the Garmin FR920XT, FR620 and Fenix2. With that introduction out of the way, let’s get things cooking. 1) To start, you’ll go ahead and begin by clicking up top in the upper right where the bell is and select ‘My account’, then choosing ‘Sharing’, which should take you here. 2) Next, you’ll see the option to connect to Garmin Connect. You’ll want to click that little logo. 3) From there it’ll zip you over to Garmin Connect for you to authorize that you want to allow SportTracks access. Clicking ‘Yes’ would be a prerequisite to success. 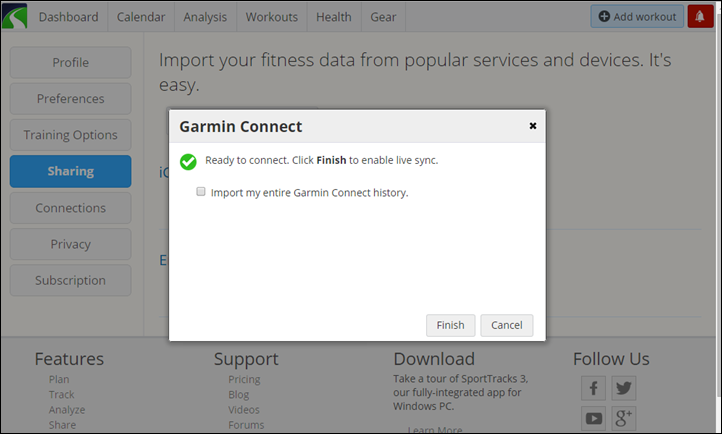 4) Then you’re given the option to import your entire Garmin Connect history to SportTracks. To do so, you’ll click the little checkbox. There’s some duplicate detection logic, which I’ll cover in a moment. 5) In my case, I figured ‘Why the heck not’, and went for it. It’ll then prompt you for your Garmin Connect username and password. 6) With that, it’s now connected. It’ll show you the last time it accessed your account below that. 7) From there, a few minutes later it’ll start syncing your old workouts in the background – working backwards from today. As a general statement, this will take a heck of a long time. Approximately forever. Don’t worry, you can go about your life until it completes. How long it’ll take to complete will depend on how many activities you have in Garmin Connect. Note that they have a duplicate detection feature that prevents duplicates if an activity start time is +/- 3 seconds. 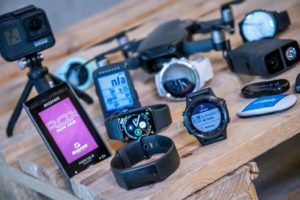 This will prevent activities they you already have in SportTracks from getting copied over again from Garmin Connect. So while that’s good, it’s always possible a few might slip through. 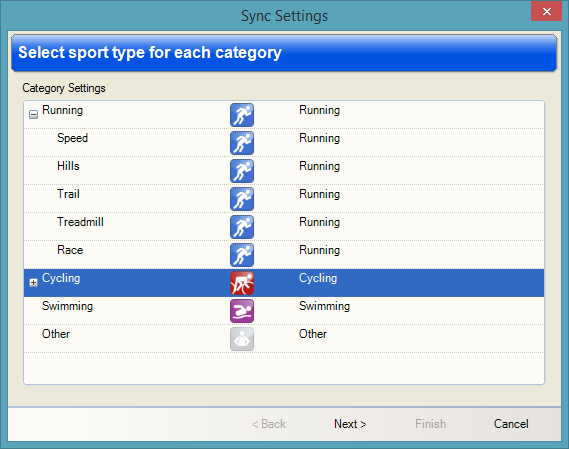 Finally, note that it’s a one-way sync, it does not send activities from SportTracks to Garmin Connect. Next, you’ll go out and do an activity. This part is pretty much the usual. 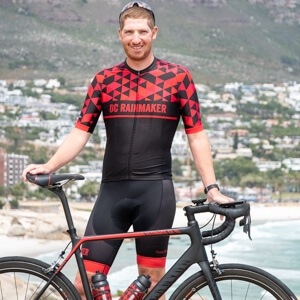 It supports any Garmin device that uploads to Garmin Connect, so you can use a Garmin Forerunner watch, or a Garmin Edge device – or the Garmin Fenix lineup. Doesn’t matter really. For those devices where you have Bluetooth Smart or WiFi, that’s where things shine though, because it’s all automagic once you sync. That means that after I completed my run and walked into the house, I immediately found my run already on SportTracks, due to the automated WiFi upload. In this case, I was using the FR920XT, but the same would have been true of the FR620 too. And of course all of this data gets pulled into your various summary analytics data. For example, here you’ve got the last few years of my Garmin history that was pulled over – all now visible. And if you look at features for the multisport athlete, they have a much cleaner interface for swimming support, such as pool swims as seen below. Something that Strava simply doesn’t support at all. Note that like other Garmin Connect sync services there are some limitations here. For example, sites like SportTracks are unable to actually see any tweaking of activity names on Garmin Connect or any other settings there for new incoming workouts. This is because they simply get sent the raw .FIT file straight from Garmin Connect. So you’ll have to manually update the activity name on SportTracks if you change that. Now SportTracks also has a desktop app, in fact, it’s what initially drove me to using them years ago. As a desktop app, it’s pretty much the king of customization and devices with plugin offerings and all sorts of ways to show unique data for athletes. With that in mind, you can actually sync directly to their online option and thus in turn get your workouts from Garmin Connect as well. To set that up, go into Settings > CloudSync. Then, you’ll see a ‘Start Sync’ button, which will begin the sync process from their online site. This will go about its business for some time, depending on your interweb speed and total number of activities. And just like before you can work offline without any issues since everything is copied locally. With that, go forth and sync. 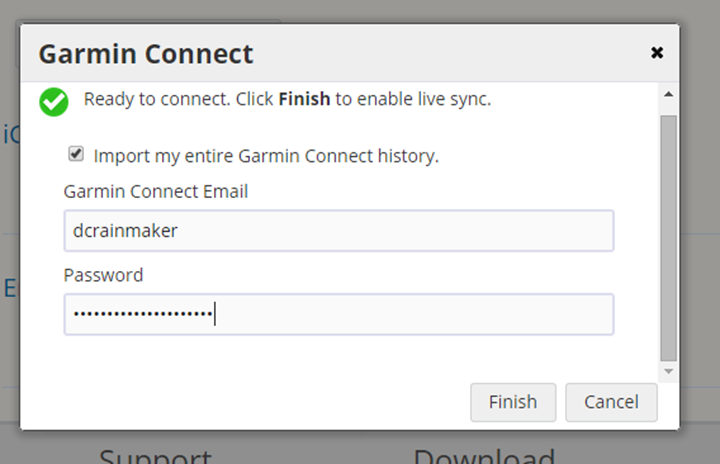 Note that this will be the last post I do on the Garmin Connect sync relationships – mostly because I’ve covered all the major ones. For example, Endomondo recently went live (I don’t use the service though, so I can’t comment there too much), and then MapMyFitness should go live within the next week. Of course, this is in addition to Strava and Training Peaks back this summer. Well lookee there, we have the same password! SportTracks is great for the people that don’t use it. Have been using the Deskop app for years and love the sporttracks.mobi site. Very excited about the new synch. I cannot see the option in my Sharing tab there. Might this be a Pro feature that the regular user cannot see? Sporttracks.mobi is simply excellent. Not only because of all the data they present to you, but also the look and feel. I love its responsive design which makes it look good on any device. The only thing I miss from other services is the social part with ablity to browse other members activities etc. It’s always fun to see where others run or bike to find new routes. 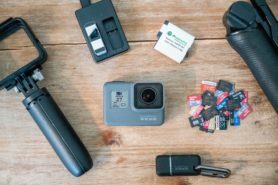 How about a comparison /review of the big 3? Sporttracks, Strava, TrainingPeaks. Comparing swim,bike,run, other fitness, and social perhaps? It’s something I’m tempted to do from time to time, and I know folks would appreciate it. It’s one of the areas I’m always hesitant on because the apps change so quickly. So what I write one day can be out of date the next. It shifts slightly less so with web apps than mobile apps, thus, it might make a bit more sense. +1 on that request! I prefer sport tracks over the other platforms because simple looks better and easier navigation, but cannot find pre maid training plans (the main reason i use those platforms is to import workout plans to my cal and device). How about a quick overview of what each service attempts to offer to differentiate itself from the others? Longtime Garmin user, but I’ve never used/transferred data to any of the other sites/apps. I’m curious what value there is to be gained from each before I go to the effort to download the apps, create accounts, import data, etc. I keep hoping Garmin Connect itself will add more value, but that’s a slow moving train. It’s absolutely awesome to see this released. Tapiriik was good, but having native support can’t be beaten. I love sporttracks.mobi – huge thumbs up to Aaron and the team. Ray’s already explained that. 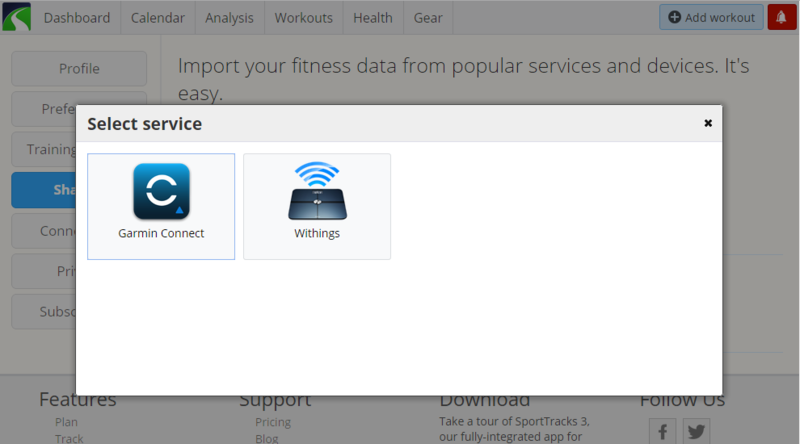 The other services get the fit file from Garmin, just as it came from your device. They have no way of knowing what changes/titles/etc. you’ve made in Garmin Connect. It’s just like a manual upload, except you don’t actually have to do one. I don’t use GC for anything other than pass through. If you’re using ST, I can’t see why you’d need any titles, comments etc on GC. I actually like how things are now. I sync to strava, but mostly for the social stuff. 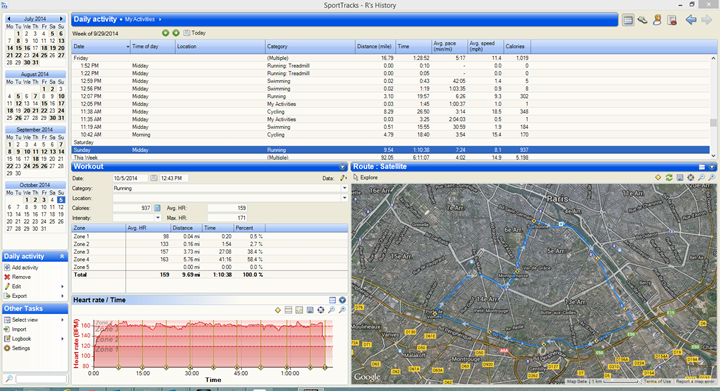 I dont want everyone there to see my comments, so I use TrainingPeaks for that, where I also keep things private. The way this sync works is actually perfect for me (may not be for others, though…). I used to upload from my FR110 into Garmin Connect, Strava, Endomondo and Sporttracks. Now I can just let Garmin Express sync my watch when I connect it, and GC will automatically send the “raw” .FIT file to all those sites, in seconds. It’s fantastic. I never liked syncing activities based on file exports, as there are always things that may be pre-processed, like smoothing. This way I know for sure the actual FIT file from my watch gets sent to every site. Kudos to Garmin and all others!! there used to be this plug-in for ST3.1 (the desktop application) whereby you could import everything from Garmin Connect straight into the app. This no longer works, and I guess it is related to garmin limiting access to their API. I suppose this is going to reactivate that plug-in back door for the desktop app? or we have to go through the mobi app for this to happen? I’d defer to Aaron or others on that specific plug-in, but speaking broadly… Yes, the API changes likely would have killed that (short of them finding the other backdoors). However, the new platform does require it be a B2B type connection from Garmin to a single entity. How that entity then makes the data available is more flexible though. But I use SportTracks for the pure athletic stuff. The problem with the Sync, and with any sync in general is that you end up with two exact same databases. Even if I delete my game drives or sailing from SportTracks, they will just keep coming back with teh automatic sync. It won’t re-sync the ones you’ve deleted. It’s a one-time thing. How does the altitude correction work? I am using a FR620 and the altitude measurements are extremely bad. Therefore after my upload via Garmin Connect I am correcting them in the TrainingPeak platform. This is very important since rTSS is calculated considering the altitude profile of a run as well. For me this is one of the huge downsides of the FR620. I am really considering now again to buy the V800 but I am waiting for the TrainingsPeak connectivity solution from Polar. At the moment ST doesn’t support elevation correction – it’s one of my only my issues with it. As the raw file comes from GC, it won’t have had any corrections and will be as it was out if the watch. This is on the list of requests for ST, but I’m not sure what the time frames or plans for development are. Aaron? There’s a plugin for the desktop app for ST that does elevation correction (usually in the top something lists, and free). With their cloudsync the raw synced stuff would come done, you can then apply the correction and it’ll sync that back up again. I use this for the FR620 all the time, because it’s absolutely horrible at elevation. One run, my home (start and end point) fell into a 60m deep hole while out running in just 30 minutes! The E510 I use for cycling, on the other hand, is pretty accurate (I do have the end of my driveway configured as a location for it to calibrate to on the way out and in). Really like the mobile site! I think they have done great work! The additions of the Running Dynamics is a great one! Hopefully they add multisport activities to be seen as one just like GC did some days ago. The last missing piece, at least for some people, is to make it easy to add friends. Strava has been ignoring swimmers for too long and I’ll be happy to end my premium account with them and start using SportTracks as my main site. I asked this afternoon and they said later this week, so let’s just call it sometime in the next week. Yaay – another great addition to Sporttracks. Love ST3 and Mobi. Is sporttracks and the app for the desktop free? As I can’t find a free one. No, it’s paid. You can use the desktop app in free trial mode, but it won’t enable Cloudsync, so you can’t automatically sync your workouts (though you can simply manually import them). beginnertriathlete.com also added Garmin Connect automated sync earlier this week. 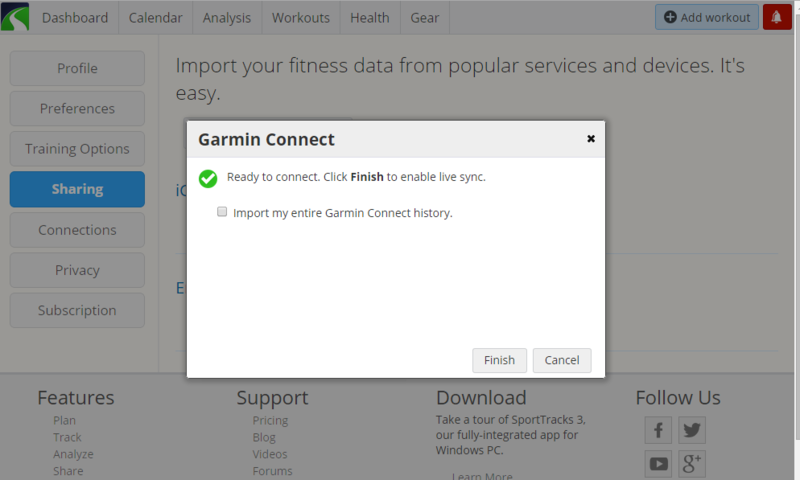 I miss to import the training data to the desktop version directly from garmin connect. With Garmin Express which I use to sync my 910XT and my Navi the trainings get directly uploaded to Garmin Connect. If Sporttracks would access Garmin Connect directl yit would be one step less to do. If I went out and got myself a Wahoo Ticker X used that and my garmin swim at the same time. Then dumped both the swim and HR metrics into SportTracks separately can I somehow sync them or work it out to get HR swim data? Do you think we can expect Nike+ site will use also this automatic sync? Ray, can you comment about import of new multisport activities in both mobi and the desktop app? IMO, not being able to have a decent “triathlon” activity type is the major downside of ST3. It splits them up – same as other apps (Strava, Training Peaks, and until last Wednesday – Garmin Connect). Suunto and Polar do however keep them tied together, as does Magellan. I’ll defer to Aaron on any future plans there for making a multisport activity. I have been a mobi user since it was beta, and I am very happy with its development so far. This looks like a natural next step. Yes ST is great, it offers great analysis and trend review etc. Ray, any rumours from anywhere around ios8 Health synch? I’ve been watching as companies (like Garmin, for example) add support for it. That said, many companies (including Garmin), are playing a bit of a cat and mouse game there with Apple and Health Kit stability and features. I suspect it may be another month before apps (and Apple) finds there way and things stabilize. But, I’m watching it and as things stabilize I plan to write something up, just not yet sure what that something is. Have you see 2Peak, nice sync with Polar, Suunto and Garmin sites. SportTracks.mobi is great!! and now with this seamless integration with GC even better! I love to see all my swimming metrics data well displayed, and the best part is that you can drag the mouse and select lengths and watch your data for any group of lengths you like to put together. Connected up to Garmin and left it overnight and it didn’t sync a single activity – do I have to enable something else in Garmin besides authorising when asked? You probably didn’t check the ‘import my entire Garmin Connect history’ option, did you? I’ve tried deleting the link, and creating a new one, but that hasn’t helped either. Yeah, me, too. I checked the box, but this morning there’s only yesterday’s ride. Maybe Garmin noticed and refused to allow it? Shoot an email to support if you haven’t yet. Workouts seem to be flowing in by the second, but we’re investigating a few support cases that seem to fail sync. It now seems to have pulled in 1 workout, that being my most recent one. Last I checked, I have a month’s worth, so it does progress. In my case, it took about a day or so from what I saw (roughly). Which, is way faster than what Tapiriik took, which was about a month. What are your thoughts on Mobi vs desktop? I’ve used the full paid desktop version for years, and therefore have hesitated to pay the subscription fee for Mobi. Does it bring anything additional to me, or just the web accessibility? If I just need to look up an activity quickly, I could always use Garmin Connect…and have ST desktop for the full log. You can use the 45 day trial and then decide for yourself. I was also hesitating at first but found out I like the mobile site and the ability to check my workouts from mobile phone etc. But I got a discount for $35/year – check their facebook as they use to have such an offer from time to time. I think I can answer this one. 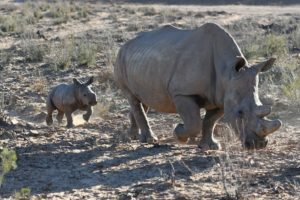 The biggest differences come with the things you can do with an online logbook you simply cant with a disconnected PC logbook. So for example, when you plan workouts you can publish to iCalendar and show your schedule right there alongside your personal calendar. You can get email reminders sent for your scheduled workouts. You can share workouts with friends or coaches and they can see the route and have possibility to fully explore your details just like you can (zooming on sections), and of course commenting on when you bonk on your hill climb. 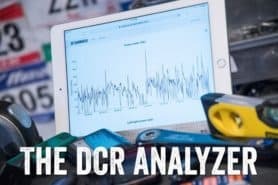 For analysis we’ve got a few features not in the PC app like interactive segment based zone analysis, but really the strength is the data publishing – the PC app still shines for it’s pure customizability – to the point it’s a bit overwhelming for newbs. What is the best way to share your workouts with a coach? I think emailing him each workout individually is not a good option, and I see no other way unless coach also pays for an account. Nope, import all from Garmin Connect feature does not seem to work over here in the Netherlands. I get new workouts synced and all, but no history. Something seems to be still off? Is sporttracks.mobi always so slow to calculate effort and update the training load graph? Or are their servers heavily taxed with all the people doing a full career import? I’m on a trial account. I like how it can give an effort to any kind of activity and how polished/simple the interface is, but the snail’s pace limits its usefulness compared to Golden Cheetah, which I’m also testing out. Yeah, ST.mobi is getting slammed right now with Garmin mass-history imports even with the pre-scaling prep we did. Currently we have training load calcs and imports running in the same priority queue… so those are getting stacked up. We’ll be making a change to prioritize training load calcs in a separate queue probably over the weekend or early next week. Moot point to you, your data should be flushed by then. Under normal conditions, first time full history training load calculations usually clock in around 5-20 minutes to calculate (with 1000> workouts). Incremental (one or a few new workouts) usually within a minute, often faster than 20 seconds. Thanks for your patience, we may throw some more metal on it this afternoon depending on queue lengths. Thanks for the reply. 🙂 I’ll stay patient with it. I have been able to see a couple cycles of training load graphs as I add workouts, but I started to get impatient as I was playing around with the future workout “what if” scenarios. I’m still early in my trial period, so I’ll stick with it and see how things improve. Training load seems to be calculating and displaying nearly instantly now. Thanks! 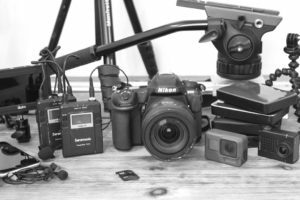 Maybe a silly question, but here goes…I have been fiddling and importing for a little while now that I have started my 45 day free trial. What would you guys & gals say is the advantage of using SportTracks over say just GC or Strava for that matter? I must admit, I am not really seeing what’s so attractive about SportTracks.mobi…. When I started my training log I was using the ST desktop app (I use it still as it, with all of its plugins, has many capabilities which any other app does not offer.) Whey I considered to move online, it was the easiest solution to move to sporttracks.mobi as it offers two-way synchronization with the desktop app. And what sporttracks.mobi offers for me over the other sites? Great view of swimming workouts, training workload calculation and continuous improvements of the whole site. I think SportTracks 3.1, the desktop edition is the best software ever. I have it with many plug-ins and I love it. Agreed its totally worth the small cost, & the plugins are great, nothing comes close in terms of flexibility & actual usable data imo. For me, at least, there’s one easy answer. When you put a cross country skiing track on Strava, it treats it as basically equivalent to laying on the couch and watching TV. OK, granted, maybe the way I do it they’re right, but it certainly doesn’t feel that way when I’m doing it. On my Strava training log, a day of cross country skiing is a “rest” day, although if you tag it “Nordic skiing” it’s cross training. Enough of my history has flowed to SportTracks by now (looks like all of 2009 and later is there now) for me to see that cross country skiing is treated on the same basis as cycling. So there’s that. Of course, Strava has segments (which I care nothing about) and equipment tracking, so those are pluses for them. The reason I signed up to SportTracks in the first place is the photo above where Ray shows the pairing page, and it shows Withings. So now my Withings account is paired to SportTracks as well, and they get all of the weight data, including fat mass (not that I trust that measurement all that well). They don’t get blood pressure or the ludicrous step count that the iOS Withings app takes using the phone’s accelerometer, though. Only thing i would like to see is this Effort number to appear in the desktop app. TRIMP and TSS are different from Effort from what I understand. In my workouts does not apear the option to view my Kcal? It apears in Kjoules :(…. Its possible to apear in kcal?? Ray, in your opinion worth paying a subscription? Ray, Do you see any downside to setting automatic sync? Right now I manually upload to both Garmin Connect and Strava. It would simplify things a bit but not a huge time saver since I want to name my Strava activities. No major downsides that I can see. I love it, especially for Training Peaks since it shows up there immediately. But, #2 is more of a me-issue. #1 though is something I think that Garmin needs to work with entities on exposing that data. I’d like them to follow the Suunto model where the data is sync’d over following my defaults and then I can tweak them after. So in my case activities would sync to Strava marked as Private, and then I could simply unlock them as applicable. It’s a bummer that Garmin broke the API the Sporttracks Garmin Connect plugin utilized, and is charging the $5000 API access fee to developers. I’m a paid owner of the Sporttracks desktop program and just want to pull data from the device into it. But I have no interest in paying another $59/year just to be able to pull data through Garmin Connect and through Sporttracks Mobi into the desktop app. Cabling up to the laptop would be nice to avoid, but not at that price. I’m with you. I paid for a years subscription for st.mobi and its nice, but it doesn’t add anything significantly that I want or need, except getting at the data from my Fenix 3 it appears. I mostly don’t share my activities, don’t have a coach, am not obsessive enough to need to view my workouts on a mobile device, and anyway I can do that through Garmin Connect mobile app on Android which I need to get notifications on the Fenix 3. I have been using the SportTracks desktop app as a personal training log for about six months and I haven’t needed for the sporttrack.mobi plan as I use Strava to publish my trainings. 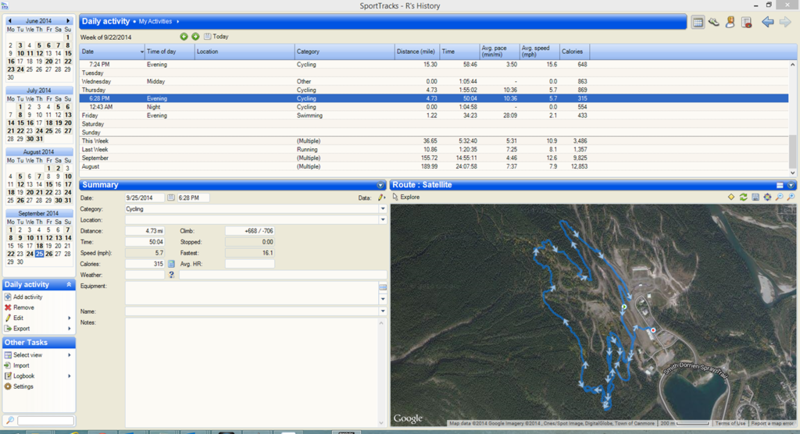 I do have Garmin Connect history dating back to 2009 and I wanted to have this in SportTracks as well so I signed up for a free trail at sporttracks.mobi and synced it with my desktop app through CloudSync. Then I set up Garmin Connect sync like Ray described on this page. All activities (except those already uploaded from my computer) were synced to sporttracks.mobi. So far so good. The problem is that CloudSync doesn’t pull them through to the desktop app. Am I missing something? I have tried signing out from CloudSync in the desktop app and then logging back in. 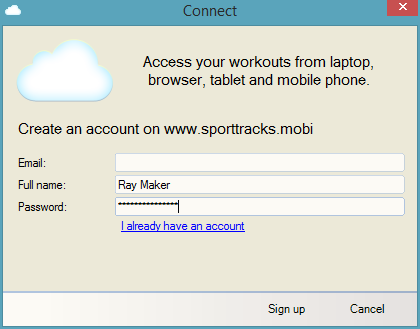 CloudSync works for all new activites I add on sporttracks.mobi, it just doesn’t sync the old ones (Dec 2009 – Sept 2013). I have found a solution, but it’s quite cumbersome. If I edit an activitiy on sporttracks.mobi (e.g. adding a location) that was imported from Garmin Connect, it is synced to the desktop app. I would ask on the SportTracks forums. I have had trouble with sync between ST3 and ST.mobi and you can get pretty good help pretty quickly there. One thing that is missing here is a discussion about the fact that Effort in ST.mobi to be different from the usual Training Load form ST3 desktop so it is not only a matter of sync your current ST3 with mobi. Could you please talk about that? 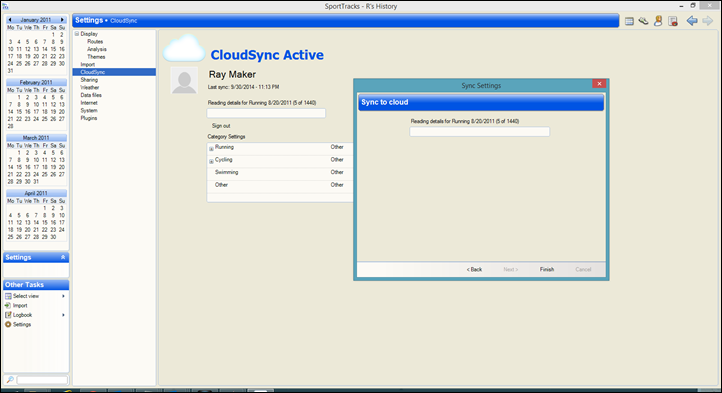 How come that I can´t find the “Cloud Sync” option in my ST3 desktop-version? I have a paid version of both ST and ST-mobi? Besides – since I startede using garmin-connect and file-import from ST-mobi to my ST-desktop it seems that my laps disappear in ST-desktop? -Casper you can get SportTracks tech support by posting on our forums or via email. So, I read carefully through the comments, and had already asked on the sporttracks forum with no reply, I take it that you cannot import from a Fenix 3 to Sporttracks desktop EXCEPT through the Garmin Connect sync to the st.mobi site? Ouch, my bad for buying a Fenix 3. @Mark The SportTracks PC app supports data import of all Garmin devices, including the Fenix 3. Navigate to the folder on your PC where the Garmin Express stores your FIT files, select Import > File and import it directly. Done. I like ST mobi as well. I would be happy about a road map. Is something planned? About 80% of our feature development time is driven by user requests or ideas that we have added to the board. The other 20% going to necessary infrastructure/workflow/architecture improvements. You can submit your own ideas, vote on ideas, comment or subscribe to get updates on progress. The roadmap for big-picture features roughly follows the top vote count. We also allow some time to add quick features (< 1 day) that people requested. Those are flowing in constantly; the website is updated weekly. We're currently working on #1 on the list: Major improvements to workout planning – allowing structure (intervals) and new goal types (heart rate, power, etc), and integrating that to watches. You'll also see announcements on Facebook, Twitter and our newsletter. Not working for me, it imported all data from garmin (3 days ago) however no sync of new activities. I’m missi g the last three days in here. The supoort guys say its garmin, however I do get al, the activities in strava and training peaks. Not. a happy camper so far.